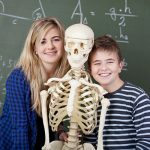 This engaging Young Scientist Anatomy & Physiology class will create a wonder in your student for the amazing creation of the human body. We will explore all eleven systems covering: bones, muscles, joints, integumentary system, nervous system, endocrine system, the senses, blood, cardiovascular system, lymphatic system, immune system, respiratory system, nutrition, urinary system, digestive system, and genetics. This class does not cover details of the reproductive system but does include fetal development. Students will also learn how to conduct experiments, write basic lab reports, take notes, and study for tests. Exploring Creation with Human Anatomy by Fulbright and Ryan. ISBN 1935495143. You only need the text. This was my daughter’s first introduction to MyFunScience and boy did it set the bar high. Mrs. Baer is one of the sweetest teachers I’ve ever seen interact with kids and it was all online. She has a gift for making each student feel heard and special. Her heart for God is evident in everything she does. She is a superb instructor who is well organized with an excellent command of the content and age appropriate context. I'm a science geek and really picky about science classes. I have no hesitation recommending this class to anyone. We’re looking for other classes that Angie teaches for my daughter to take in the future. And….we secretly want to move onto her farm. Loved that she shared bits of her life for that extra personal touch.